With perfect strategy and using standard online Casino rules, the lowest house edge for Blackjack is around 0.5%. In Blackjack, the way you play your cards will have a significant effect on the edge that the house has over the you. The more optimum decisions you make, the lower this house edge will be. If you can play Blackjack with good strategy, it will become the Casino game that offers the lowest house edge. The reduce the house edge in Blackjack to a minimum, it is all about strategy, strategy, strategy. This rough table highlights how the house edge decreases as your strategy improves. Here are a few basic pointers for good Blackjack strategy. Hit on 8 or less. Between 13 and 16, stand unless dealer has 7+. Double on Ten unless dealer has Ten or Ace. Double on 11 unless dealer has Ace. Always split pairs of Aces and 8s..
That's pretty much the essentials that will take a chunk of that house edge for you. 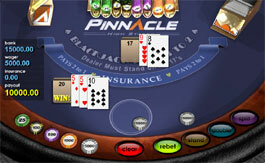 If you want a more extensive strategy, take a look at this Blackjack basic strategy page. It's not easy to learn, but it is worth it if you want to increase your chances of winning money at the Blackjack tables. To help you make the perfect decisions each and every time when playing Blackjack, you can use handy strategy tables that allow you to quickly read off the perfect play by comparing your hand to the dealer's. The Blackjack table from Wikipedia is pretty good. However, I find that whilst these charts and tables are handy, they do not help you to learn which plays are optimal off by heart. So if you went to a Casino without your trusty chart, you may have a few problems. Blackjack strategy is very logical when you actually think about why you are hitting or standing in certain situations, so try and consider why each play is the best one. By doing this, you will start to actually learn good Blackjack strategy, and not just become a player that makes decisions from a chart. After all, before you knew about good strategy, you made a educated decisions to not hit on hands like 19 or 20 pretty easily. Just build on that intuition. The top casino for high limit Blackjack is Ladbrokes, as it has a great variety of Blackjack tables and solid limits for high rollers. On the other hand, if you want the highest possible betting limits go for Pinnacle Casino with its high $10,000 limits per hand. The more you play Blackjack, the easier it will become to get used to using strategy whilst you play. It may be a little tricky at the start, but over time it will become second nature.